Conclusion: High quality decals offering interesting options for these large kits. 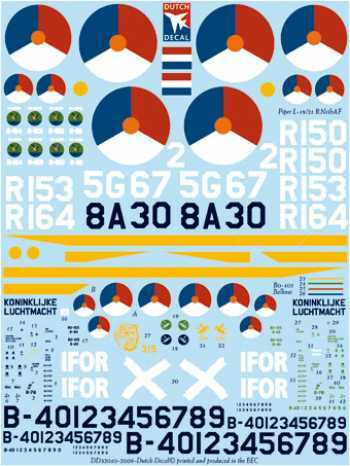 This is another excellent decal sheet produced by Dutch Decals in 1/48 scale, this time depicting Royal Netherland Air Force Bolkow Bo-105CB, Piper Super Cub L-18C/L-21B. The decals are superbly printed with good colour saturation and excellent register. As usual the carrier film is ultra thin and my experience with Dutch Decals that I have used in the past is that the decals have to be handled carefully and snuggle down into the surface detail well. I always use decal setting solution but this is not necessary. The carrier film then almost totally disappears under a coat of clear. Bolkow Bo-105CB B37/48, B63/80 of No 298/299 Squadron Gpl.V KLu/RNethAF in 1975-79. The aircraft is finished in overall Camouflage Green RAL6014/FS24064. Bolkow Bo-105CB B37/48, B63/80 of No 298/299 Squadron Gpl.V KLu/RNethAF in 1982. The aircraft is finished in Camouflage Green RAL6014/FS24064 with Black RAL9005/FS37038 applied to the upper surfaces. The Dutch national markings were painted over and a white X painted in its place. Bolkow Bo-105CB B-40 of No 298 Squadron Gpl.V KLu/RNethAF in 1982. The aircraft is finished in a wrap around scheme of Camouflage Green RAL6014/FS24064 with Black RAL9005/FS37038. The aircraft had the 2 KVP colour scheme (red-white-blue) painted to the tail for “75 Jaar Klu” in 1988. Bolkow Bo-105CB B-40 of No 298 Squadron GpH KLu/RNethAF in 1991. The aircraft is finished in the 3 KVP colour scheme wrap around scheme of Bronsgroen RAL6031/FS34094, Lederbruin RAL8027/FS30051 and Teerzwart RAL9021/FS37030. The aircraft had the word IFOR painted on the cabin doors. Bolkow Bo-105CB B-68 of No 298 Squadron Groep Helicopters GpH KLu/RNethAF in 1991. The aircraft is finished in the 3 KVP colour scheme wrap around scheme of Bronsgroen RAL6031/FS34094, Lederbruin RAL8027/FS30051 and Teerzwart RAL9021/FS37030. Piper L-18C Super Cub 18-2027. 8A-30 of No 298 Squadron based at Gilze Rijen Air Base in 1952. The aircraft is finished in overall Identification Yellow FS13538. Piper L-18C Super Cub 18-2076. 5G-67 of No 299 Squadron based at Gilze Rijen Air Base in 1953. The aircraft is finished in the wraparound camouflage of Khaki FS30095 and Donkergroen FS34079. Piper L-21B Super Cub 18-3843. R-153 of Groep Liche Vliegtuigen GpLV based at Deelen Air Base in 1973. The aircraft is finished in the wraparound camouflage of Khaki FS30095 and Donkergroen FS34079 with yellow engine cowl and fuselage stripes as part of the Demoteam Popsy Black for KLu Public Day in 1973. Piper L-21B Super Cub 18-3854. R-164 of Groep Liche Vliegtuigen GpLV based at Deelen Air Base in 1973. The aircraft is finished in the wraparound camouflage of Khaki FS30095 and Donkergroen FS34079 with yellow engine cowl and fuselage stripes as part of the Demoteam Popsy Black for KLu Public Day in 1973. Piper L-21B Super Cub 18-3602. R-112 of Groep Liche Vliegtuigen GpLV based at Deelen Air Base in 1973. The aircraft is finished in the wraparound camouflage of Khaki FS30095 and Donkergroen FS34079 with yellow engine cowl and fuselage stripes as part of the Demoteam Popsy Black for KLu Public Day in 1973. Piper L-21B Super Cub 18-3840. R-150 of Groep Liche Vliegtuigen GpLV based at Deelen Air Base in 1973. 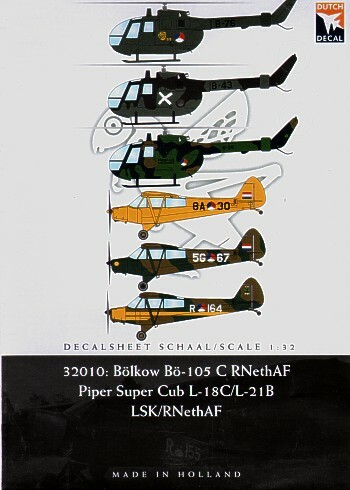 The aircraft is finished in the wraparound camouflage of Khaki FS30095 and Donkergroen FS34079 with yellow engine cowl and fuselage stripes as part of the Demoteam Popsy Black for KLu Public Day in 1973.